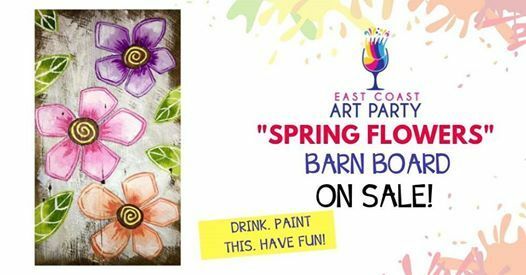 "Barn Board Spring Flowers" ON SALE! Join us in the Art Party Studio for a night of painting and fun! 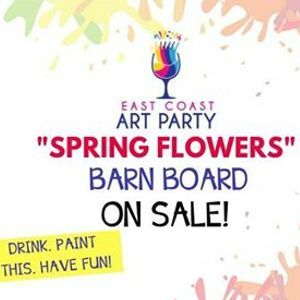 East Coast Art Party is PEI's only dedicated paint and sip studio. Absolutely no experience required for this art class! Simply sign up, and show up with the only expectation being to have fun doing something different. These classes are incredible for meeting new people, staff parties, date nights, or just an evening to yourself. You will be guided through the painting process, step by step by one of our incredibly talented locally trained artist instructors whom are absolutely fantastic at what they do! You'll love it! Please see our terms and conditions at: www.eastcoastartparty.com/terms for our cancellation policy.